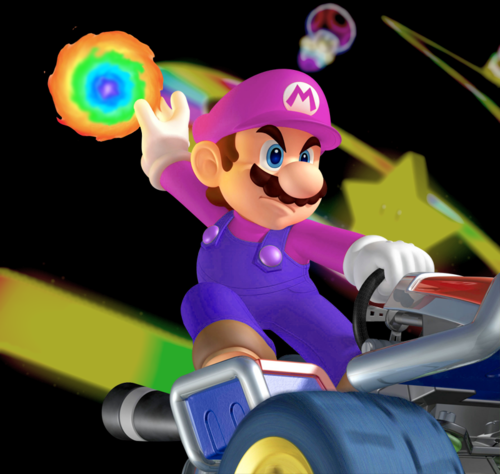 The Gay Gamer: Who's up for a Mario Kart 7 'gaymer night'? The day all, er, some, er, a small handful of you have been waiting for has (almost) arrived! Which day, you ask? Why, the day you get to race other readers of The Gay Gamer and the Video Games Made Me Gay tumblog in Mario Kart 7. As for when this oh-so-fabulous day--evening, really--will take place: This coming Monday, Jan. 30, at 7 pm PST. If you've always wanted to see how terrible I am at Mario Kart 7, aim your 3DSes at The Gay Gamer community--22-7203-7866-8075--at the aforementioned time and then arm yourselves with as many blue shells as you can handle. Thanks to the great guy behind Video Games Made Me Gay, by the way, for suggesting this little soiree and for allowing me to steal the "Gay Pride Mario" image seen above from his tumblog. Hooray! I'd like to be present. I work until 6, my time...which is 8, your time...add dinner and stuff to the mix, and I doubt anyone will still be around when I get to it. Boo. Actually, Justin, 7 pm PST is 9 pm your time, if I'm remembering correctly. (You're in Central, right?) I imagine we'll be racing for a while, so as long as you can pop in between, say, 9 and 11 pm Central, you shouldn't find an empty community. Don't feel too bad, Justin, I screw up time zones all the time! Bryan, I'm planning to be there, possibly a bit after 7 pm, but hopefully very close to that start time! Immensely satisfied with how that turned out. Thanks, all! Well, when I left at 10:30 I was in 1st place, which surprised even ME! But more importantly, I had SUCH A BLAST! And Robb (Fooster) did, too! Let's do this again really soon! Thank you, Drew! So glad you had a blast. So did I! Which one were you, anyway? Driiw?? Oh, that's GREAT, Justin! And Fooster was Robb? I was wondering who that was! Sorry I had to duck out so quickly. I actually played two rounds with another group of people, and after the round I played with you and Robb and a few others I had to bow out due to dinner demands from the husband. I'm planning on publishing a post about this tomorrow, and in that post I'll ask everyone to share their opinions on how it went, what they thought of the scheduling (day of the week, time, etc.). Also, are people OK with it being 150cc, or would they prefer 100cc? That sort of thing. Anyway, thanks again for taking part. Can't wait to do it again!